I’ve got something of a history with rogue likes. For some reason, if it involves permadeath and randomness, I will dump dozens of hours into it. As more of my spare time is devoted to non-gaming pursuits, I find myself inserting a great deal more mobile gaming into my routine. Out There was thus custom made for my commute. Now let’s see how well it fit. Scattered narrative set pieces, including the introduction and endings, are well drawn in a suitably cosmic style. Though there is no real animation to the game, things often go the way of motion comics, with pans and zooms adding a dynamic element to the scenes. The star to star transitions have a cool warp effect applied, too. All in all the graphics are slick and well done. No complaints. 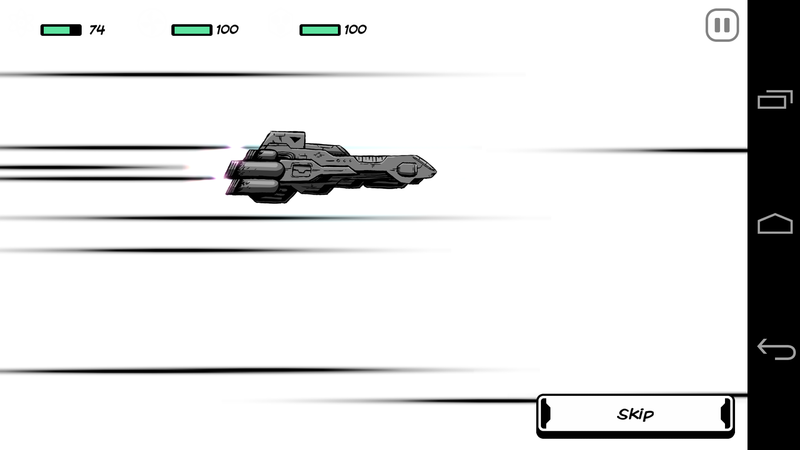 The way I’ve described Out There to people is a simple sentence: FTL without the combat. Since I’m now writing a full review, I should probably go deeper. At its core, the game is about resource management. 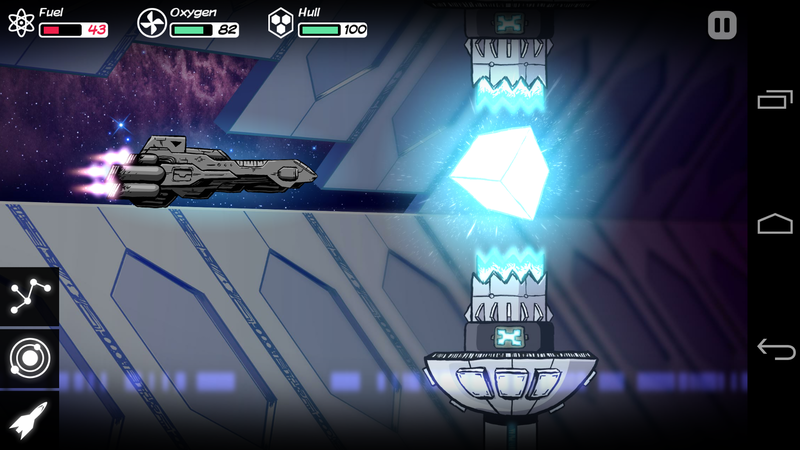 The ship requires three things in order to continue to function: an intact hull, fuel in its tank, and oxygen. Everything you do is in some way related to maintaining these levels. Fuel, for instance, can either be hydrogen or helium, with helium twice as efficient. Let’s say you’re getting low, so you travel to a gas giant. The good news is, you sent down a probe a few times and brought back more fuel than you burned the bad news is, the orbit of a gas giant is hazardous and you damaged your hull. That means your next stop should be a rocky planet, where a little drilling could earn you some iron to fix your hull, but getting there, getting to the surface, drilling, and getting back will make a dent in your fuel again, and your oxygen, too. Now you need to find a garden planet, which will top off your air, but also damage your hull and burn more fuel. 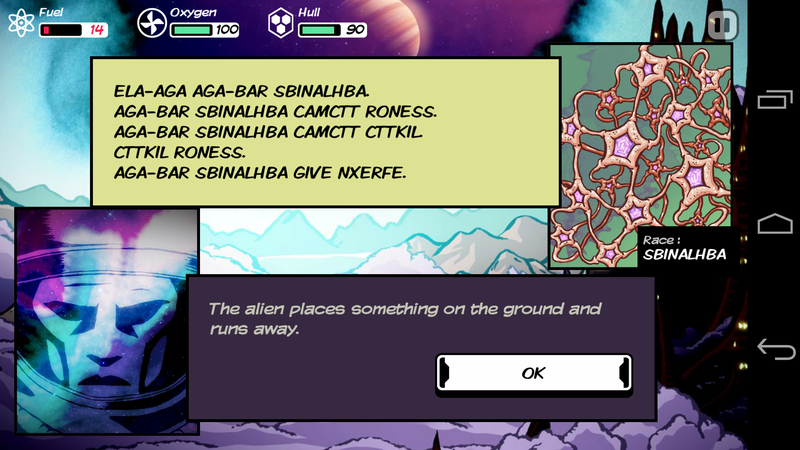 The game is a long string of finding sources of iron, oxygen, and hydrogen. 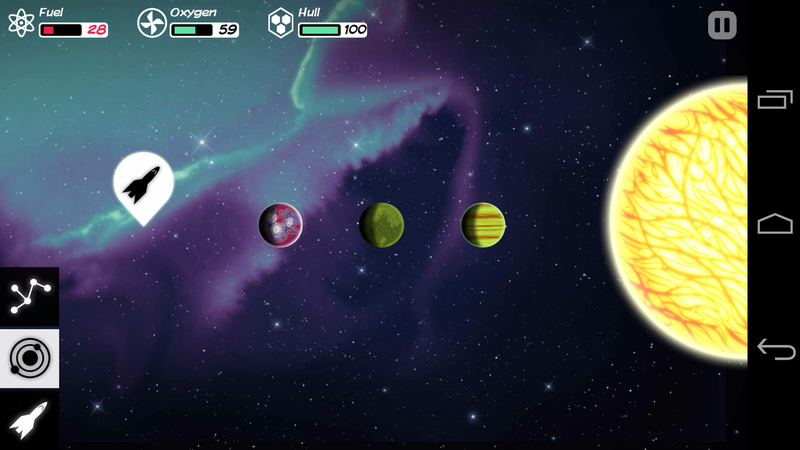 Since planets eventually reach a point of diminishing returns, you can’t just keep harvesting the same star system. You’ll always be on the move. In true roguelike fashion, every play through is different, randomly generated and riddled with random events. Maybe on your way to another planet you’ll encounter a moon-sized ball of liquid helium to top off your tanks. Maybe a heat-devouring creature will latch onto your hull. Sometimes you’re just along for the ride. Other times you have to take a guess with no hope of knowing which one is the right choice. Then there are the trickier ones. Things like knowing complementary colors or the first few primes can help you avoid disaster. Then there’s simply knowing the language. You see, among the many randomized elements of each game is the language. 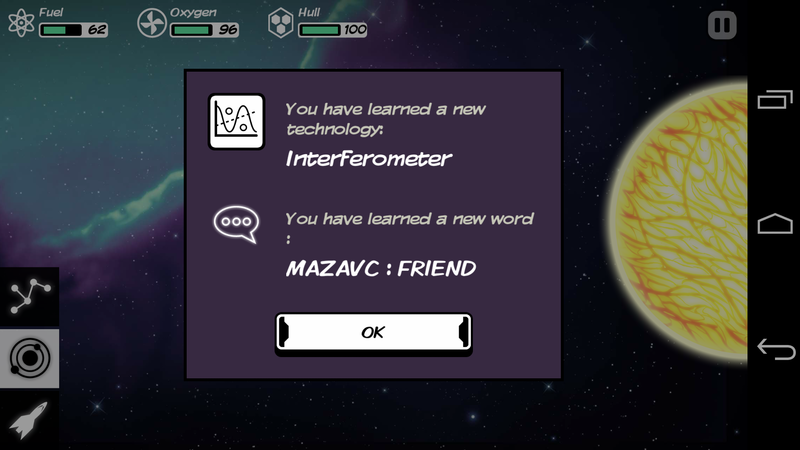 There is an alien language you must learn a few words at a time, usually through encounters with intelligent life on alien planets. Knowing it can help you gain favors and technology from aliens by knowing how to avoid saying, for instance, that you want to kill them. The language often is also used to label the better choices on random events. I could seriously go on for five more pages telling you about the depth of this game. You’ll juggle space in your ship, trying to find ways to store backup supplies while still installing items in optimal locations to enhance their operation. New ships with more cargo space or better engines could be waiting for you. A little omega (an all-purpose resource that fuels, provides air, fixes the hull, fixes any mechanism, and even collapses stars) might bail you out long enough to strip an otherwise worthless ship for resources while you’re trying to cobble together a powerful enough space folder to bridge the gap between two distant stars, only for a space shark to tear you up and leave you to start over. It is a roguelike, you’ve got to be willing to tackle an insane learning curve, and play it a dozen times before you know enough of the ropes to survive reliably to the mid and end games. If all of this wasn’t enough to get you hooked, this game has one of the deepest integrations of achievements I’ve yet encountered in a mobile game. Top notch. I never know what to say about the sound in a game, particularly a mobile game. In my case, it sounded like me taking the bus to work. The music and sounds fit the tone, but something tells me you’ll end up playing it muted while you’re, shall we say, sitting someplace private waiting for nature to take its course. 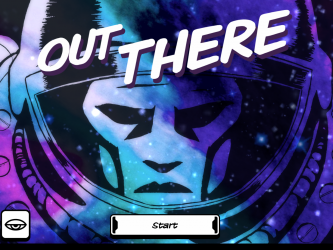 For a cellphone game, or a roguelike for that matter, Out There has a fairly deep story sprinkled to the player in an inventive way. Earth is low on resources, so we start sending out explorers to find resources. Our ships are slow (sub-light speed) and thus our pilots are put into cryogenic sleep. You play as a pilot who slept too long and ended up an unfathomable distance from home. As you play, if you’re diligent, you’ll find out little snippets about the heroes and villains of this section of the galaxy. There are godlike shapers of the universe, kill-crazed monsters, and the primitive races who fear them. If you play long enough, you’ll be treated to three endings that are interrelated and quite satisfying. If you’re a stickler for grammar, there are a few questionable translations, but I just chalked it up to cosmic rays cooking our hero’s brain. If you are a fan of roguelikes, and I am, then I don’t think you can afford to miss Out There. It is well made, absurdly deep, and makes a boring commute fly by. 9.5 / 10: One of the best spins on the roguelike format to ever make its way to a phone or tablet screen.